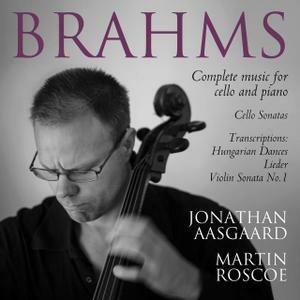 This release by Norwegian cellist Jonathan Aasgaard (the principal cellist of the Royal Liverpool Philharmonic Orchestra) and British pianist Martin Roscoe purports to be a complete recording of Brahms' music for cello and piano. In fact it's padded with quite a few other things that have little or nothing to do with Brahms other than the fact that he composed the original music: the transcriptions of Brahms songs and Hungarian dances and of the slow movement of the Piano Concerto No. 2 in B flat major, Op. 83, were the common currency of home music-making until recordings came along, and that of the Scherzo of the F-A-E Sonata, composed collaboratively by Robert Schumann, Albert Dietrich, and the young Brahms, is one of several versions of this violin-and-piano work made for cello. That leaves the two cello sonatas and the transcription of the Violin Sonata No. 1 in G major, Op. 78, by Brahms himself as actual Brahms works; those together are slightly longer than what will fit on a single CD, which seems to have been the motivation for the rest of the program. The violin sonata is the highlight of the whole thing; the transcription fits Aasgaard's clear, elegant tone in the cello's middle register. There is nothing much to object to in the two Brahms cello sonatas, but there are clearly new and old versions available that cut a sharper profile: those Antonio Meneses and Maria-João Pires (in the former category) and Mstislav Rostropovich and Rudolf Serkin (in the latter) come to mind. The recording is not a unified project, either artistically or sonically; the performances come from three different recording sessions, albeit all at the same venue, the church-to-concert hall conversion called the Friary in Liverpool. For chamber music it's a bit cavernous.